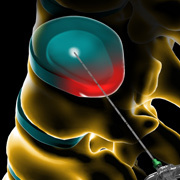 Nucleoplasty can relieve pain and improve quality of life for many patients with herniated discs as well as or better than conservative management, a new review has found. 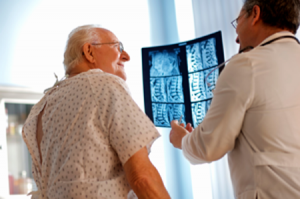 Herniation resolves within weeks to months with no treatment in at least 90% of cases. But when anti-inflammatories and steroids—both oral and injected—fail, surgery often follows, raising the specter of potentially serious complications for patients. There are a variety of interventions that have their place between conventional conservative measures and surgical treatment. Nucleoplasty is one of them. Nucleoplasty also might help keep patients with chronic pain from becoming part of the epidemic of opioid prescriptions. The doctors analyzed three previously published studies of nucleoplasty, or plasma disc decompression, for herniation. The studies, totaling 275 patients, showed that pain scores were lower after nucleoplasty compared with conventional management for a period of two to six months. Based on the two most recent studies, both of them randomized trials, the researchers found the approach improved pain scores in three months by about 22% more than traditional treatments. Patients receiving nucleoplasty reported reductions in pain of an average of five points on a 10-point scale. Nucleoplasty might be less invasive than surgery, and it may provide more long-lasting effects than steroid injections, which don’t seem to last very long. One of the studies was not randomized, while the other two were randomized but not blinded, which could exaggerate the estimated benefit. He also pointed out that the trials addressed different conditions: cervical and lumbar disc herniations. The investigators agreed that additional research is needed to determine long-term benefits and risks. One needs to be more proactive in exploring and applying new targeted treatments for pain as opposed to unjustified prescription of opioids for chronic back pain.